FastHealth Corporation has developed an online Human Resource Center that makes healthcare hiring much easier. 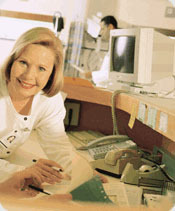 Many healthcare professionals turn to the Internet to find new careers. They are educated and searching for the ideal position. Simply listing job positions on your website is insufficient. You must have a marketing angle to get your job postings high traffic. You must go many steps further if you are going to compete for quality healthcare workers. FastHealth understands what is required to turn the Internet into your best hiring medium. Our hospitals have experience setting up job postings and they are increasing exposure to potential applicants through search engine access. Search engines like GOOGLE "crawl" FastHealth servers most evenings. FastHealth has developed an HR solution that removes any and all paperwork. Imagine referring every applicant to your website to apply, and then imagine reviewing the applicants online, and having the ability to sort and forward applications to other managers. This system must be seen to understand how valuable and beneficial it is. FastHealth's HR solution permits applicants to apply at a desktop computer in your hospital or anywhere in the world on the web. Management of healthcare hiring has evolved to this much simpler process. FastHealth Online Assessment components allow HR managers and HR directors the ability to properly assess employees on the local hospital website. It is simple to create material and multiple-choice tests through our software. All test scores are graded by FastHealth proprietary assessment software and then properly sorted for review.